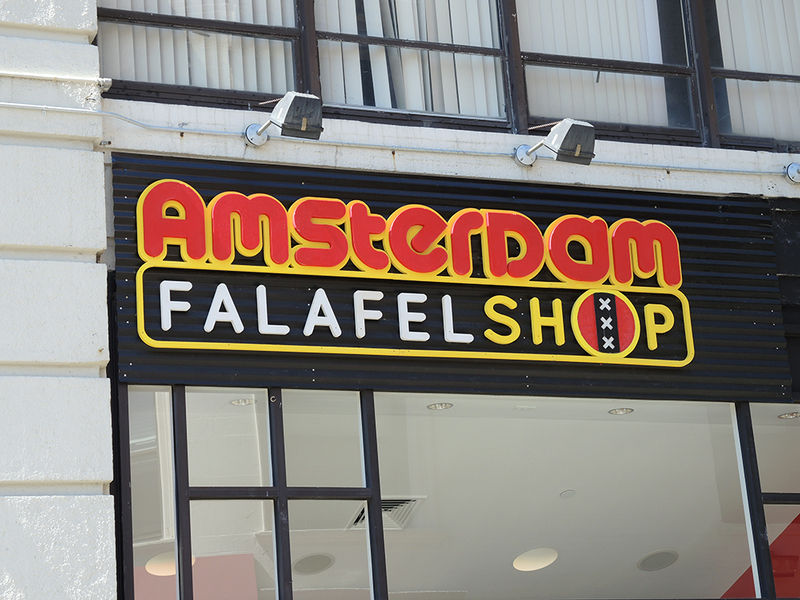 A week ago I was invited to try the new Amsterdam Falafelshop location in Kenmore Square in Boston, MA. I will admit that I was a little skeptical at first of another falafel store opening up because I’m especially picky about my falafel. There are a lot of bad imitators out there as well as a lot of even worse recipes. 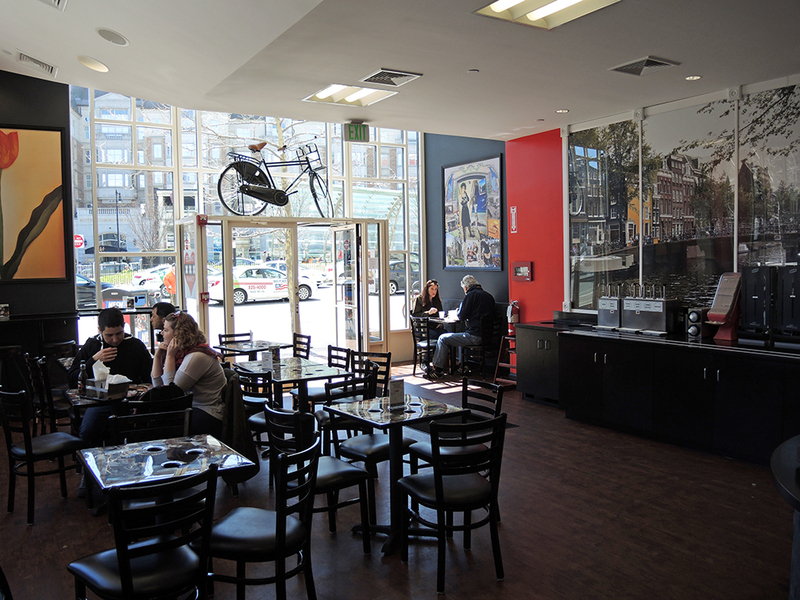 Nonetheless, I wanted to keep an open mind to give this new location a try, so I headed over to Kenmore Square with two of my friends. We had the opportunity to speak with the manager as well as the owner, Matt D’Alessio, about the motivation behind the expanding franchise. 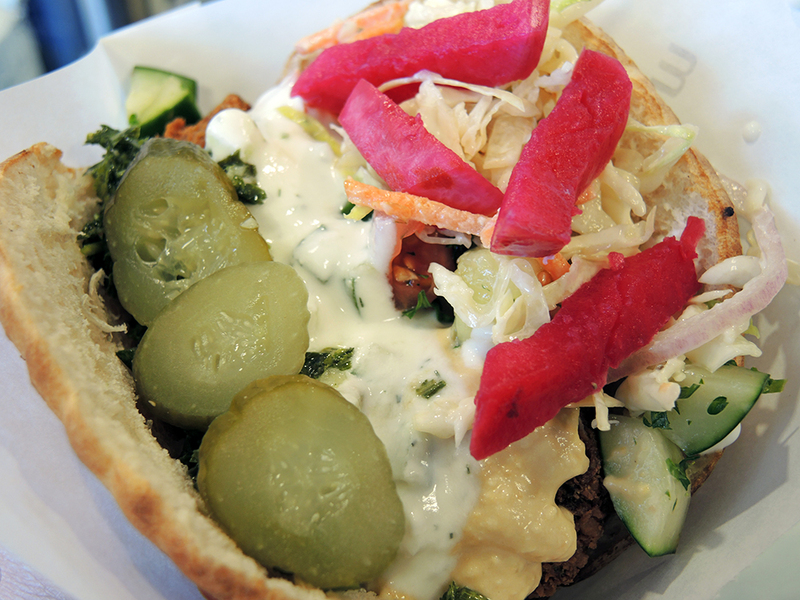 What we found at Amsterdam Falafelshop was a modern take on an ancient and classic dish. The interior of Amsterdam Falafelshop is bright with a lot of light. The seating is casual with custom-made tables that are designed to hold the paper cones of fries or even a precariously balanced falafel sandwich. The owner, Matt D’Alessio, informed us that the decor and salad bar service style is inspired by Amsterdam itself with the red wall colors acting like an homage to Amsterdam’s infamous “red light district.” Pictures of Amsterdam are on the walls and tables just to give an added impression of the origins behind this Dutch style of falafel service. 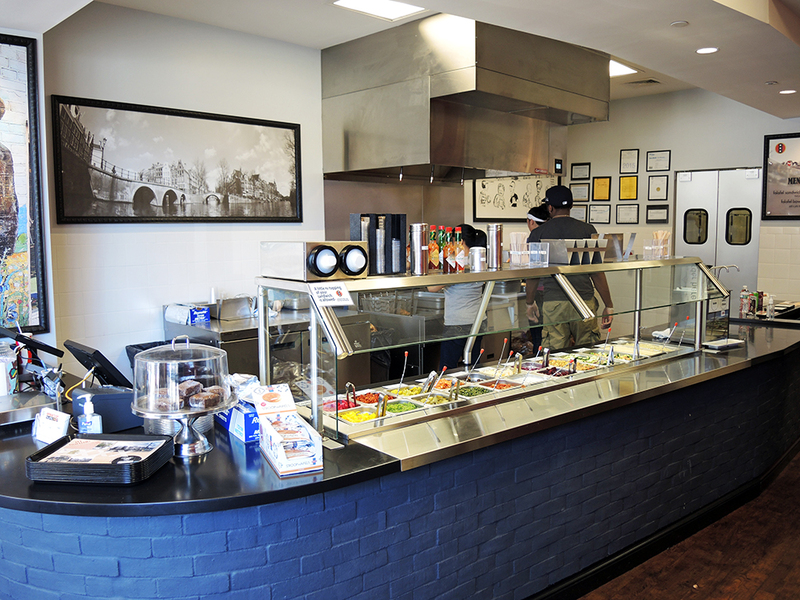 When you go to order at the counter, you’ll pass a salad bar full of Middle Eastern treats like hummus, baba ghanoush, pickled vegetables, tabouli, yogurt sauce, and some other less traditional items like cabbage slaws. 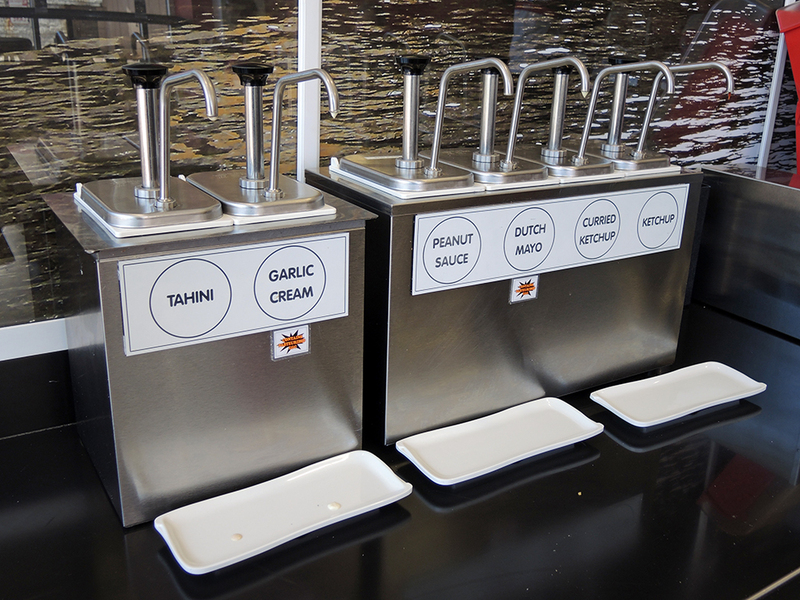 These toppings are what patrons use to customize their falafel orders and the combinations are completely up to you. The menu at Amsterdam Falafelshop is remarkably simple. Customers have their choice of a falafel sandwich, a falafel bowl, and frieten (dutch fries). They also serve house-made brownies. 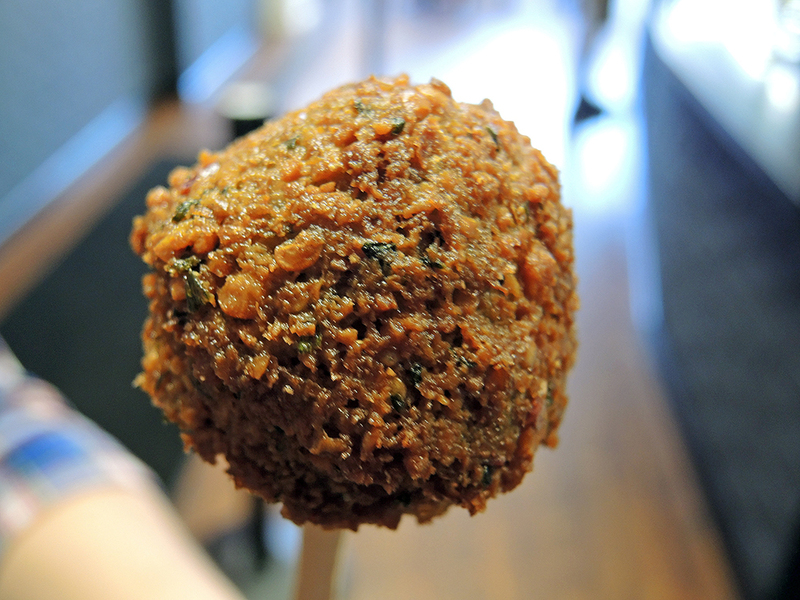 While the menu is simple, the restaurant boasts the discovery of the “perfect falafel recipe.” We got our first opportunity to check out their falafel with a quick sample of one piece on a wooden stick like a falafel-pop. The first thing I noticed was the shape and color. The chickpea-base falafel seemed perfectly cooked to a deep golden-brown and the shape maintained a true spherical form. 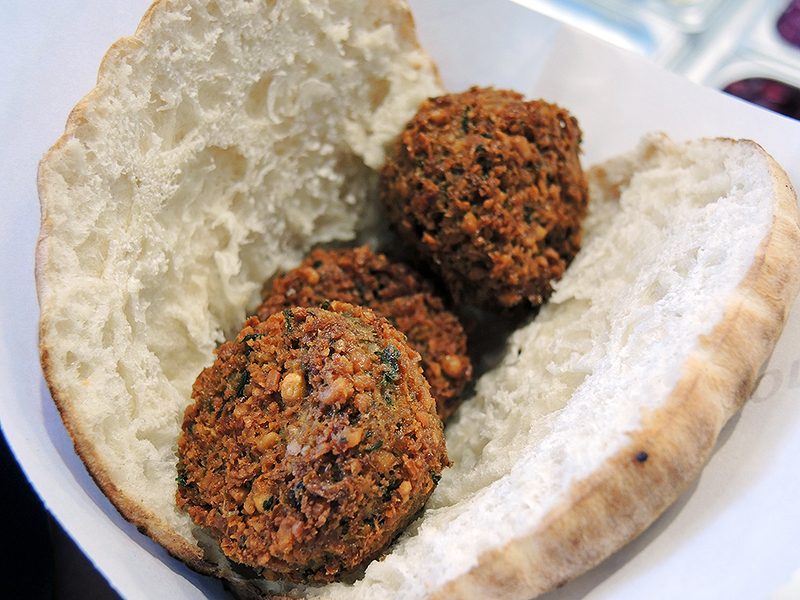 Falafel tends to have a range in shape from somewhat flat and circular to the spherical, or even in rarer cases, a donut shape with a small hole in the middle. A quick bite confirmed that this style of falafel, which held together well, also had a crumbly, but not dry texture inside, indicating an evenly cooked falafel throughout. All falafel should contain classic middle eastern spices, but the strength of those spices will range just like the shape. Amsterdam Falafelshop’s spice profile contained all of the right spices such as garlic and cumin, but also seemed a bit heavy handed when eating a falafel on its own. I quickly discovered, however, that one reason for the heavy spices is that this falafel is meant for pairing with bread and/or numerous items from the salad bar. The beauty behind this recipe is that you don’t lose any of the falafel flavors no matter how much you pile on for your custom sandwich or bowl. 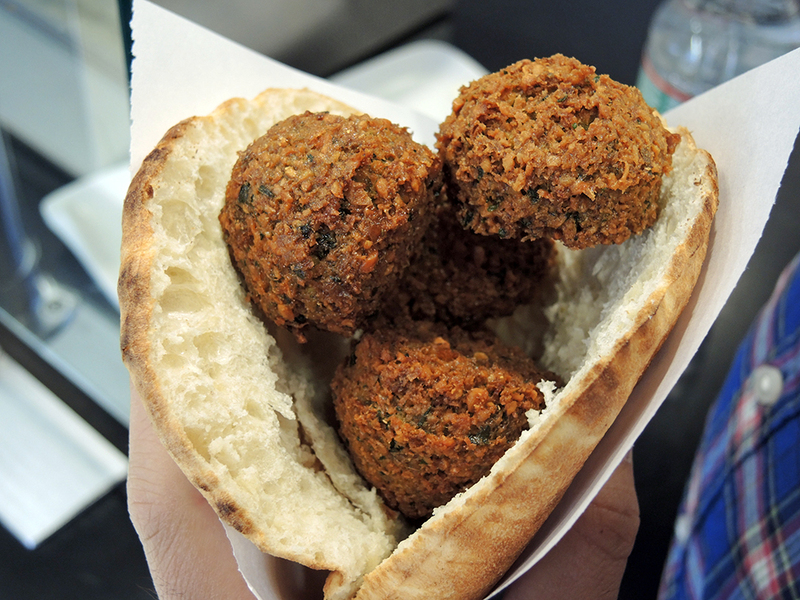 Falafel Pocket – There are two sizes of falafel pocket, which are regular and small. One of my friends and I immediately ordered regulars that come with five(!) falafel balls per sandwich. When my friend’s came out first on thick, warmly toasted, pita pocket bread, I could see that his sandwich was overflowing with falafel. While that was awesome, I immediately grew concerned that I wouldn’t be able to fit a lot of the awesome ingredients from the salad bar into my own pocket, so I quickly downgraded to a small, which comes with an ample three falafel balls. Now I had plenty of space to create a masterpiece at the salad bar. 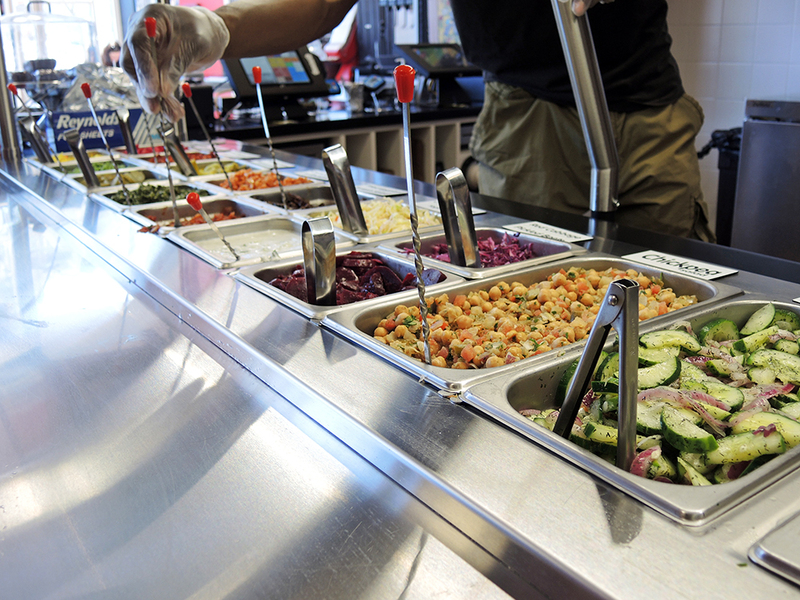 After getting our falafel sandwiches, we moved over to the salad bar and started to assemble or custom sandwiches. I’ve been to many falafel restaurants where you can pick and choose your ingredients, but this is the first time I was actually able to assemble my own sandwich outside of my house. I set to work and topped my own sandwich with hummus, dill yogurt sauce, marinated cucumber, green cabbage slaw, wild cucumber pickles, and pickled turnips. The result was not only beautiful to look at, but extremely delicious. The bread isn’t the kind of bread I would normally use at home or the kind I find in my favorite falafel restaurants, but it was actually really excellent. It had a great mild flavor with a soft texture, but most importantly it also remained durable enough to withstand a lot of ingredients. My sandwich held strong all the way to the last bite and I even set it down for 5 minutes when talking with the owner. Falafel Bowl – If you don’t feel like having a sandwich, then Amsterdam Falafelshop offers falafel bowls like the one my friend got. 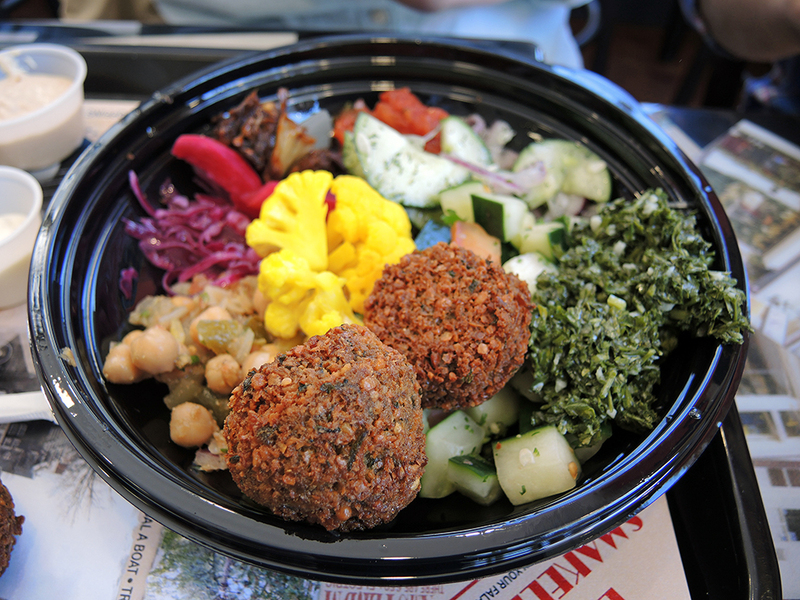 She chose to get only two falafels and then filled her bowl with a variety of delicious items from the salad bar. 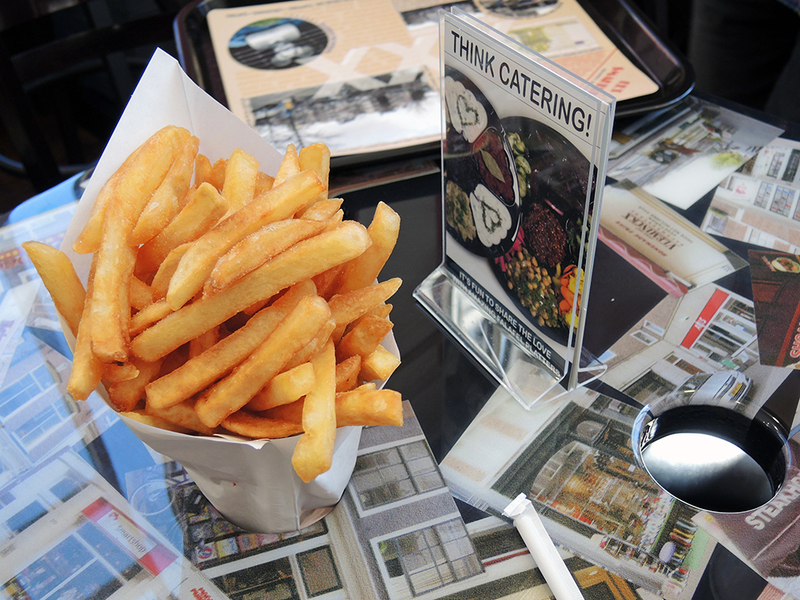 Frieten (Dutch Fries) – Another staple of Amsterdam Falafelshop is their Dutch-style twice fried, fries. They come in a classic paper cone with no real frills or bells and whistles. They are just solid, good, and tasty fries. They go excellently with a falafel sandwich or bowl and the tables in the restaurant are designed to hold the cone for you while you eat. One fun addition to getting the fries is trying all of the condiments at the restaurant that you can use for the fries. They have plain ketchup, curried ketchup, garlic cream, dutch mayo, tahini, and peanut sauce. 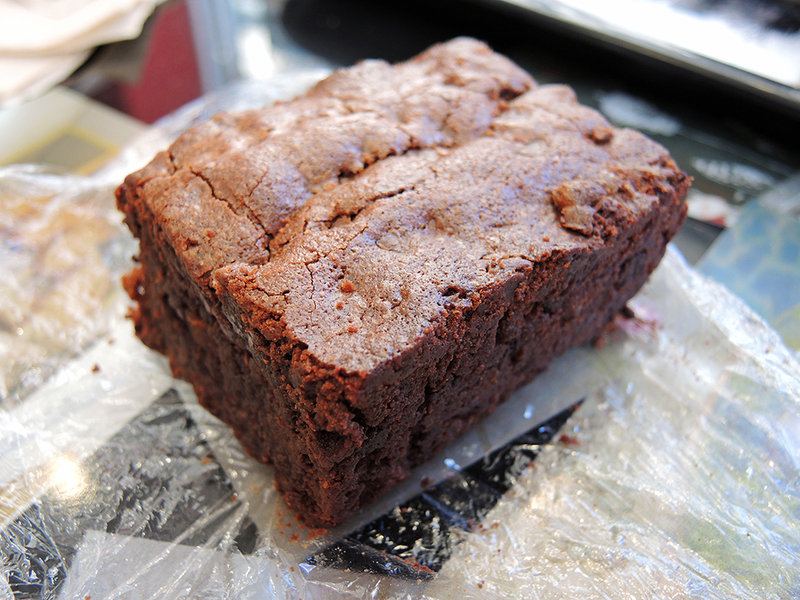 Virgin Brownies – Lastly, we tried one of the house-made virgin brownies. The brownies are a play on Amsterdam’s pot brownies, but of course, these do not have any drugs in them. The brownie itself is crumbly, yet moist, and full of little chocolate chips. It’s a nice way to balance out the end of a savory meal. My friends and I had a great time trying Amsterdam Falafelshop. More importantly, I’m ecstatic to have discovered a new falafel place that can actually provide a worthwhile sandwich. I would highly recommend stopping by any of their franchise locations for a unique experience that will satisfy a craving for falafel made correctly. This is a restaurant I know I will return to when I’m on the prowl for falafel in the Boston area. Copyright © 2015 Man Fuel Food Blog. All Rights Reserved. The content on this page is owned and written by Man Fuel Food Blog (www.manfuelblog.com). Duplication or use of this content without permission is prohibited. The presence of this content on any site other than Man Fuel Food Blog is a violation of this Copyright. For permission requests to use some or all of this content, use the contact form in the “About” section. Sounds like an interesting place! !